You didn’t get your ticket for the midnight screening?! Away put your weapon and join us to celebrate one of our favorite iconic movie series! Next Thursday night the new Star Wars movie “The Force Awakens” will be released at midnight in theaters. 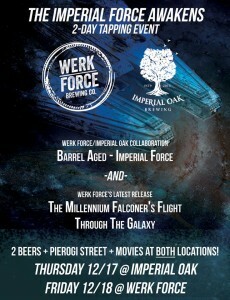 We however, will be releasing “Barrel Aged Imperial Force”, an 9.5% imperial black ale at 3pm. You may remember that the original version of this collaboration with Werk Force Brewing was tapped last spring. We held back a little just for this occasion, and aged it in a Koval Oat Whiskey Barrel for 7 months. To add to the excitement we will also be tapping a keg of Werk Force’s Millennium Falconer’s Flight IPA, brewed with Falconer’s Flight, Millenium, and Galaxy hops. To top off theis inter-galactic collab we will be showing the original Star Wars trilogy all evening. “A New Hope” will begin playing when we open at 3p and Pierogi Street will be serving at 6:30p. Can’t make it out on Thursday? It all starts again at Werk Force on Friday at 6pm….It is useless to resist! barrel aged, Collaboration, werk force. Bookmark.